I’m so happy to have Sally from The Curious Reader children’s bookstore in New Jersey here to share some picture book gems she recommends! Sally has wonderful taste in books and her store’s Instagram account is a must follow for the kidlit community! My first 2017 love. This tale of kindness repaid is perfect in all the right ways: well-paced, beautifully illustrated, and emotionally rich, despite the only words in the whole thing being sounds. I’m hoping this one gets all the recognition it deserves at awards time. Thyra Heder has only written and illustrated three books, and each one puts a unique twist on traditional picture book storytelling. Her new one is a tender love story between a girl and her pet turtle and is told from each one’s point of view. The pictures are gorgeous and filled with detail, and the inventive structure doesn’t diminish the story’s emotional impact – if anything, its power is enhanced by the two different perspectives. Plus, an absolutely perfect surprise ending. This one is another top book from this year. The lovely, witty illustrations are worth lingering over, and the build up to the revelation of this city-dwelling croc’s job is masterfully executed. Told mostly in panels, there are a couple of double-page spreads that are breathtaking, and like most wordless books, it just gets better with each read. I have a theory that one of the most difficult things to pull off successfully is producing content that will make both children and adults laugh – The Muppets, Sandra Boynton, and Mo Willems are all experts at walking this fine line. This Japanese import manages to be hilarious to all ages; a perfect, simple idea, executed with deadpan brilliance. A little boy gets stuck trying to take his shirt off and, after struggling for a bit, gives up and imagines what life would be like with the shirt stuck forever. One of my least favorite types of kids’ books are the ones that totally forfeit charm and storytelling for a blandly presented be yourself!!!!! message. Ugh. It’s not giving kids enough credit, and is a terrific way to get them to hate books. That’s why books like this one are so great: it’s quirky and well-written and has a really neat Italian feel, PLUS it’s got a bunch of good messages about practice and hard work and staying true to oneself mixed in. Also, Amandina Goldeneyes is just a terrific name. I believe there is no artistic style that Shaun Tan could not master, and on top of that, he’s a super thoughtful guy with a brilliant, weird imagination. Pretty much all his books are perfect, but this one’s a tiny bit more so. Fifteen odd stories, beautifully and inventively told, some quite powerful, all remarkable. Everyone should own this book, this tiny little jewel. The narrator imagines what his friend, Kuma-Kuma Chan, does during the day: “He trims the nails of his paws. Then he lines up the cut nails and gazes at them. He lies on his roof and just looks at clouds floating by. He lies on the floor and listens to the sound of rain falling on the roof.” This book will always make me feel at least 30% better, so I keep it right next to my desk. One of the top five funniest picture books I’ve ever read (Kid Sheriff and the Terrible Toads by the same team is also top five), and the book that made me love Bob Shea. A little boy imagines how he’ll take over the world, in a glorious outline of his “BIG PLANS! BIG PLANS, I SAY!” Unfortunately out of print, this is a book worth tracking down from the library – I guarantee you’ll be quoting it immediately after. 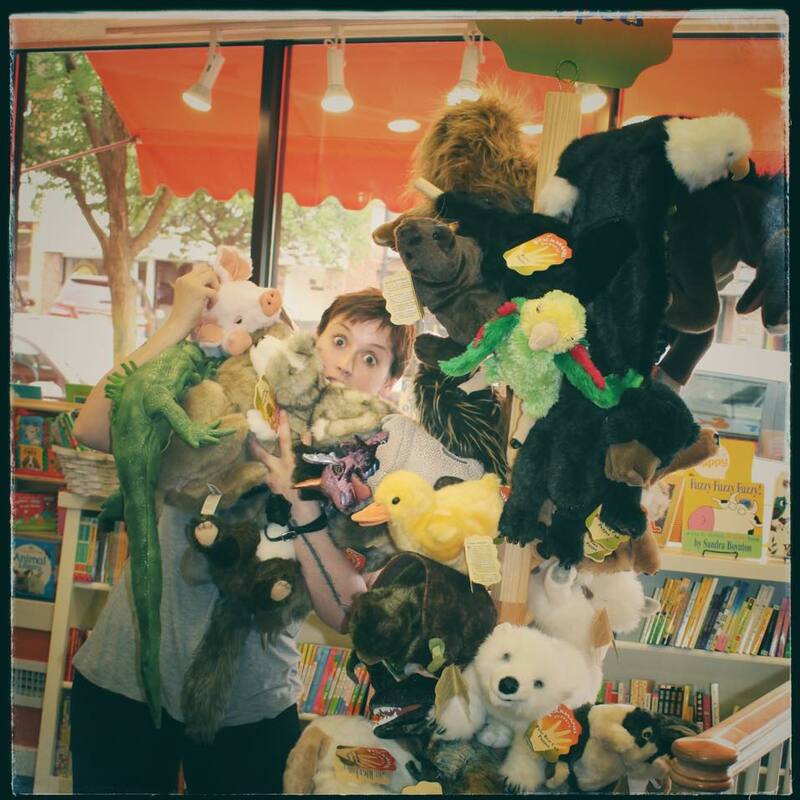 Sally Morgan has been a children’s bookseller for over twelve years, and in 2013 she and her father opened The Curious Reader, a unique children’s bookstore, in Glen Rock, NJ. She tries to read at least one picture book a day. You can see my previous post with another bookseller’s children’s book recommendations—Jen from Vroman’s in Pasadena, California, too! Ooh – some favorites and some I must seek out! What a wonderful list of recommendations. Sally is the best. Always helpful with great suggestions. Love love Professional Crocodile and Wolf in the Snow!